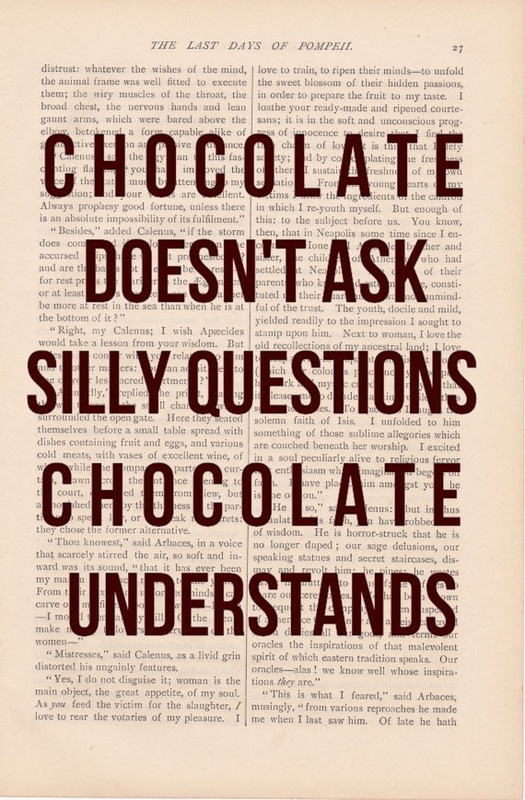 When it comes to indulging or allowing myself a treat I NEED chocolate to be in the mix some way or another. A few years back my sister and I decided to pack up and ship out, we did our very own version of the amazing race only there was no cash prize in the end, instead we got to shower with our flip flops on a daily basis. Another daily ritual that we embarked on everyday we nicknamed tradition. This “tradition” meant that every day after lunch we would go on a hunt to find the BEST gelato (not a tough feat while in gelato land) and every day we would get in a line and talk about the flavors that we wanted to try. But like a creature of habit I would reach the front of the line and the chocolate lover in me would cave… I even decided one day that today would be the day I would try something new… Be a little more adventurous. I’ll have the dark chocolate please, and for those of you that haven’t been to Italy the gelato is piled high like pillows of joy. 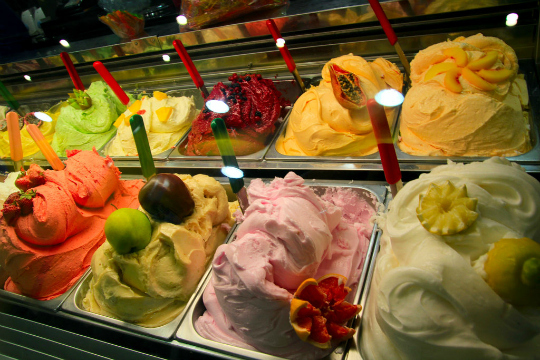 Ya sure there’s the coliseum and the Sisitine Chapel, or the Coliseum, but the gelato… now that’s a memories. So when I came up with this little doozy of a recipe I even shocked myself that it was pretty much chocolate free. I say pretty much only because the crust had some chocolate quinoa granola in there, but I pretty much picked out all of the dark chocolate pieces and ate them before this bad boy even made it to the oven. These bars are enough to convert any chocoholic to a fruit lover for sure. 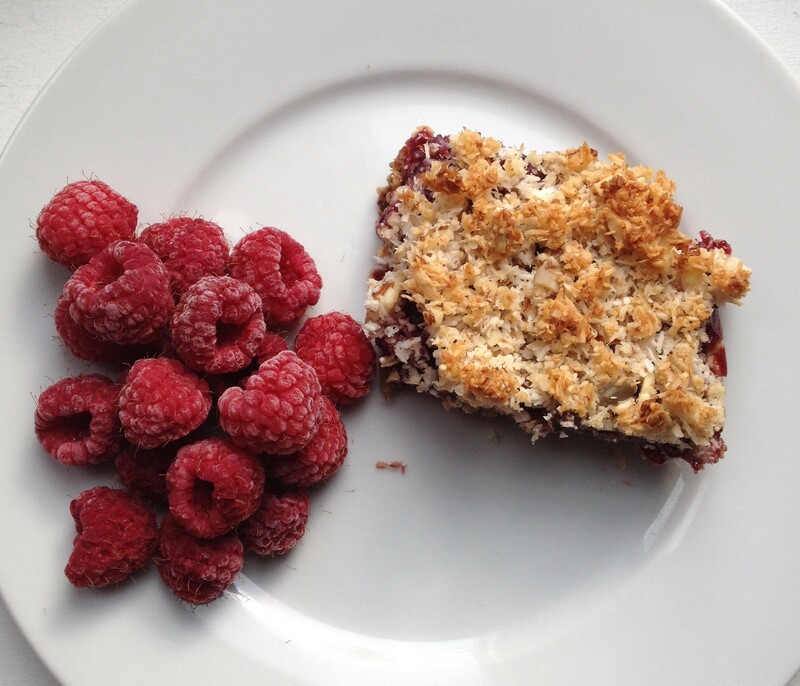 Come along with me on my chocolate free ride to raspberry delicious land. 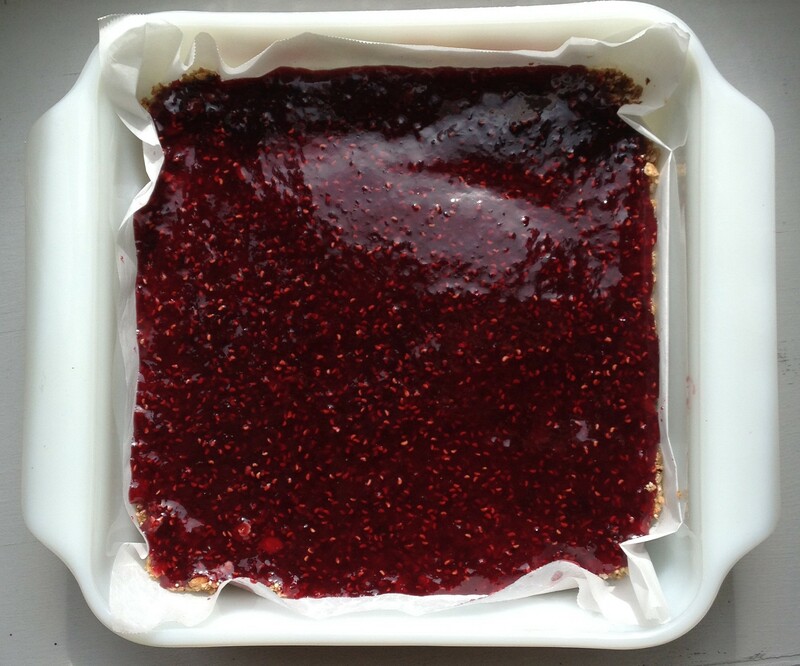 If you opt out of the easy route of opening a jar of ready to go jam and want to prepare your own raspberry filling, start by heating the honey in a saucepan over medium heat. Bring to a boil, then reduce the heat and allow to simmer for 5 minutes. Add the frozen raspberries and vanilla extract and continue to simmer. Let the raspberry goodness cook for 15 minutes until it starts to thicken up. Then you want to chill in the fridge while you prepare the crust. 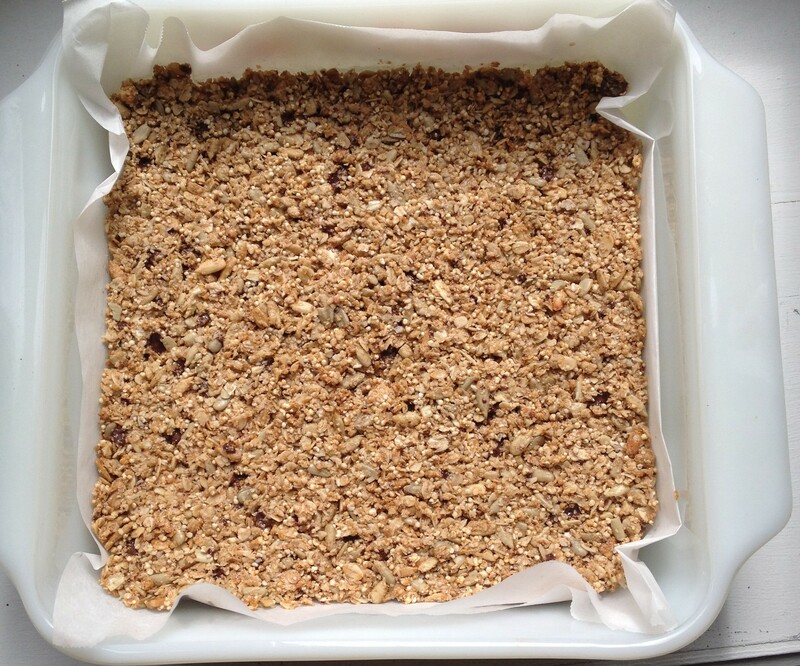 For the crust, preheat the oven to 350F and line a square baking dish with parchment paper, this allows you to cut the squares easily without swearing like a trucker when all your delicious granola bottom sticks to the bottom of your baking dish. Combine all of the crust ingredients into a bowl and get your hands in there and mix it up. Press the mixture into the bottom of the baking dish, and bake for 12 minutes at 350F. Remove from the oven and allow to cool. 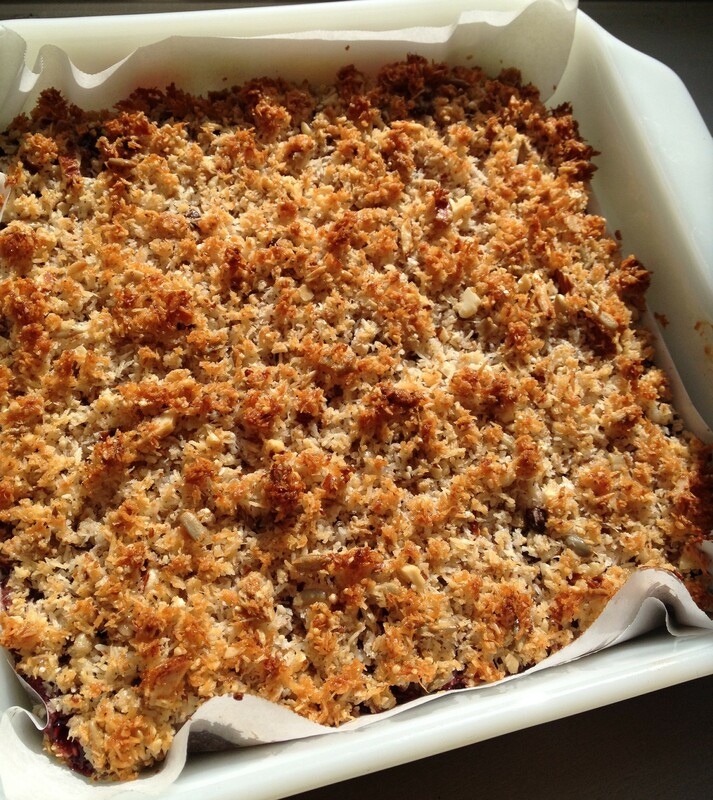 Next prepare the crumbly topping by combining the almonds, coconut, honey, coconut oil and sea salt. 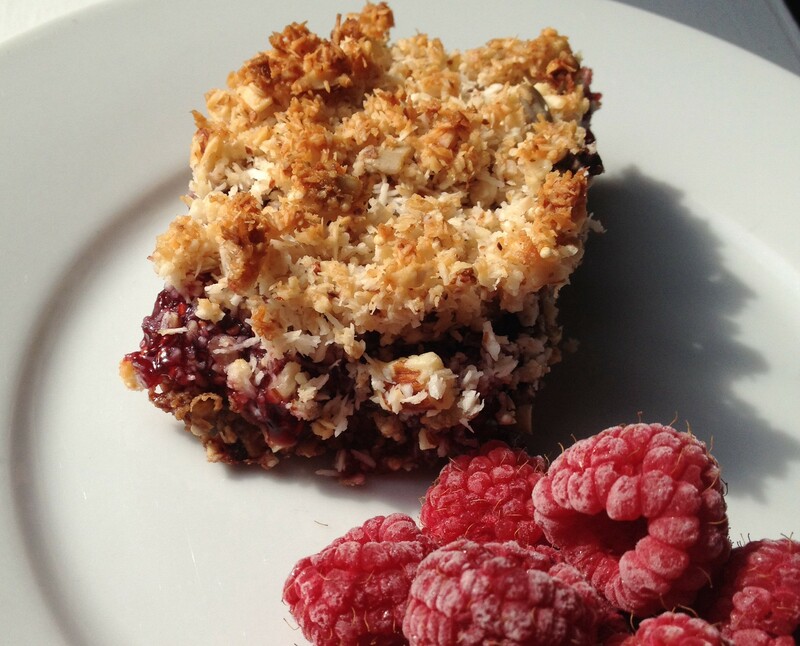 Arrange the bars by spreading the raspberry filling over the crust, then spreading the crumbly topping over the raspberries. Return to the oven for 15 minutes at 350F, or until the topping is lightly golden brown. I found these bars were much better once they were chilled, but the trick is how to wait for that process to happen when all you want to do is eat the thing the moment they come out of the oven.